Puppetry and circus have more in common than we think. It’s about movement and signification —the way both scenic disciplines find their true expression. Of course, there are many differences: while the puppeteer animates objects, the acrobat, the juggler and the balance artist perform acts that go beyond the usual limits of the human body and take a risk for it. 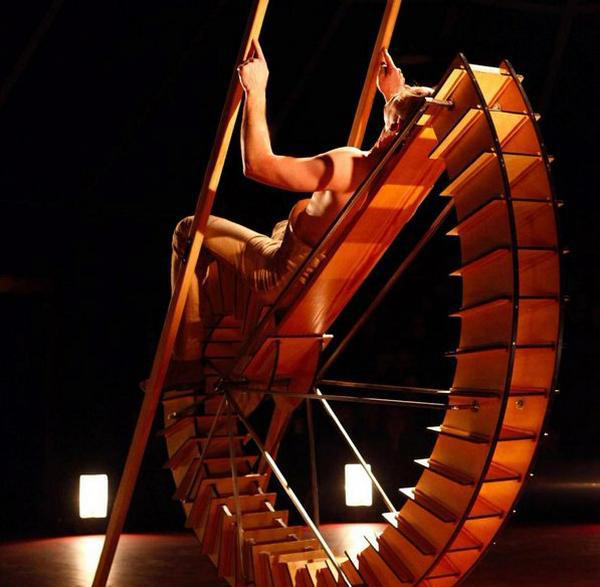 But in some modern circus productions, artists use their props as living creatures. They animate them, interact with them in a very similar way of some puppeteers. 'Vortex', by Cie. Non Nova. That’s been seen during the festival Circ d’Ara Mateix (Circus Today) at Mercat de les Flors in Barcelona this month. Though dedicated specifically to new circus forms —or precisely because of that—, some shows contained very interesting puppetry. Catalan company Escarlata Circus, for example, playing with clay and stones and knives and ropes as living symbols. But Phia Ménard and her Cie. Non Nova and Johann Le Guillerm with his Cirque Ici, both from France, go far beyond any other experience of hybrid scenic languages. The flying puppets of Phia Ménard. It was about the time that we write some lines about Phia Ménard in this magazine. If the show ‘L’après midi d’un fohen’, on the music by Claude Debussy, has been included in some puppetry festivals for the way she dances with plastic bags shaped as human figures, ‘Vortex’ is the second part of it —or rather an extended version often presented together with the precedent title, as now in Barcelona. In both shows, Ménard moves all these little plastic men with a set of fans that surround a small ring. 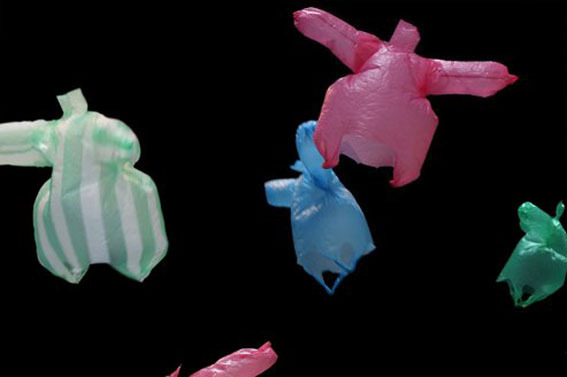 The plastic bags create an aerial choreography of independent movements that finish up in a disturbing end. Besides, ‘Vortex’ continues that same story towards the transformation of Ménard herself into a huge plastic bag that delivers a human being. Once outside that sort of a plastic monster, she dances with it and projects her personality on its figure —becomes dual. 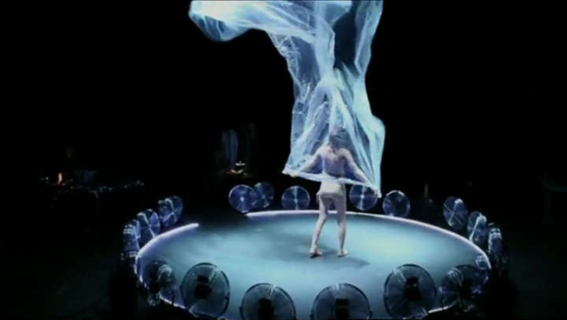 That newborn being is androgyne and, at its turn, gives birth to a long plastic sheet that will be animated at the end of the show using again the fans to form a big swirl that rises from the middle of the ring up to the circle of lights installed over the scene. It all forms a complex symbolic performance on the continuous transformation of human being and its body, as Phia Ménard herself, born Pilippe Ménard. Johann Le Guillerm in 'Secrets'. Johann Le Guillerm is one of the mnost important performers of ‘nouveau cirque’. Actually he was the first —if this can ever be said on any circus act— to create a tornado on the ring. In his show ‘Secrets’ that we’ve seen these days in Barcelona this tornado appears in at the end. It’s created with just fans, dust and lighting, but has a very strong presence on the stage —again, it moves as living matter, it’s an animation. The show by Le Guillerm / Cirque Ici is based mostly on balance acts, though it doesn’t necessarily mean that someone shows his athletic skills, but putting objects in balance. Le Guillerm is also the creator of some authomats and machines that brings to some exhibitions —unfortunately we couldn’t see any of his creations in Barcelona. Circus and self-moving machines feed each other, so we can see a trapeze act performed by vague human form made of articulated wooden long pieces or a star made of bars that comes down from the top of the tent turning and moving completely free of any human intervention —just because it gets tangled again and again with the wire it hangs to. By the way, this star finally falls in the ring as four separated bars that are, as we can see after, four rods that Le Guillerm joins in a new structure that gaits as a horse. Actually, the whole show is about building some structures with bars and boards that stay moving in the ring in precarious balance. Some look like strange, schematic animals, others are 3D geometric forms, the last one is a spiral pathway tied with ropes that Le Guillerm builds up while walking on it. One of the movement machines that appear in 'Secrets'. Johann Le Guillerm builds balancing figures in the ring.